It’s time to decorate for Halloween! I get so excited at this time every year. I always find it so much fun to choose the decorations that I will be using each Halloween. This year, I’ve decided to do something a bit different. Instead of just buying decorations (I always like to add something new every year) I thought I would do some reclaimed wood projects. I started looking for Halloween decorations that you can DIY from reclaimed wood and I found 25 amazing projects for you! Each and every one of these projects uses some sort of wood that you can take from other things. There are a number of great projects that use fence planks and even many pallet ideas. Oh, and if you’re looking for some truly amazing ways to upcycle pallets, be sure to check out my rustic DIY kitchen pallet furniture ideas. 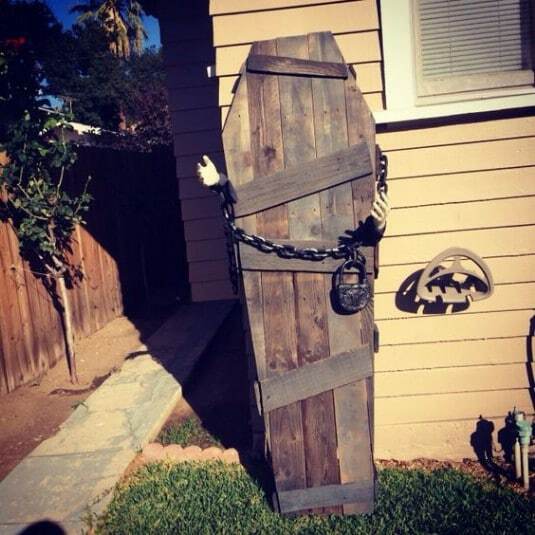 You can use those pallets to make just about anything for your home and garden, including a pallet ghost, coffin and a scary fence that you can use to mark off your very own cemetery for Halloween. Sounds spooky, doesn’t it? I love trying to outdo myself every year and look for scarier ways each season to outdo the last. While not all of these reclaimed wood Halloween decoration ideas are scary, some of them are great for adding to your haunted house and they all use reclaimed wood, so they’re really cheap and pretty easy to make. You should also check out these 30 DIY Dollar Store Halloween decorations that you can make yourself. They’re really cheap and go perfectly with all of these reclaimed wood decorations. From pumpkins and cats to scarecrows and just about anything else you would associate with Halloween, there is a reclaimed wood projects that will make the perfect indoor or outdoor decoration. Halloween is nearly here so now is the time to get started on one…or all of these Halloween decorations. Grab that old wood and pick a project or two. You’ll be very pleased by what you can create. 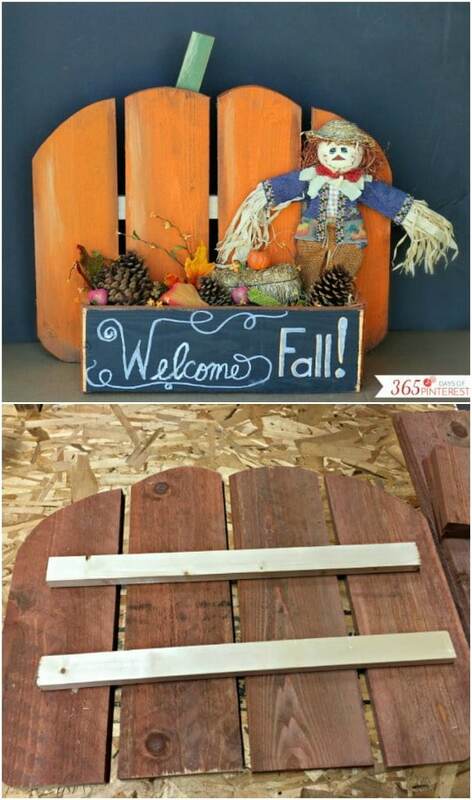 This great countdown to Halloween sign can be made from reclaimed wood pallets, which you can normally get for less than $5 each. You only need one pallet and a few pieces of board as well as paint. You’ll need a couple of pieces of plank for the numbers, which you can reclaim from pallets or other wooden pieces that you have on hand. These little ghosts are perfect for standing up on the porch and you can make both of them with just one upcycled pallet. You could also use wooden planks that you have reclaimed from any number of other things, like wood flooring for instance. The trick is in cutting the flowing part at the bottom and adding blocks of wood for the faces. 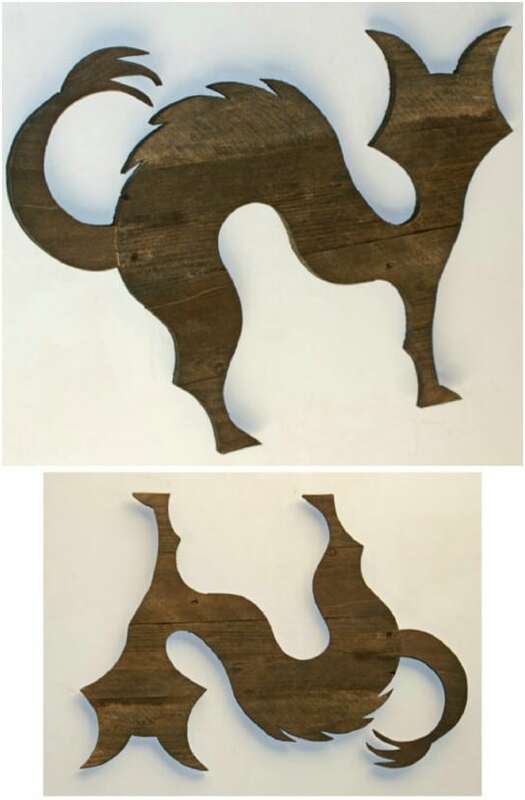 This cat is frighteningly adorable and it’s made from reclaimed wood pallets. I love the simplicity of this one and you can leave it as it is for a great rustic look or paint it black if you prefer. I found this one on Etsy for less than $40. It’s beautifully carved and is just perfect for spooking guests as they arrive on your front porch for Halloween. How gruesomely awesome is this coffin decoration? I love it! It’s made from upcycled pallets and is perfect for spook houses and trick-or-treat scares. You make the coffin from a couple of pallets and then add the lock, which by the way you can get at the Dollar Tree for just a dollar. A couple of stuffed plastic gloves will make the hands if you can’t find them already made. 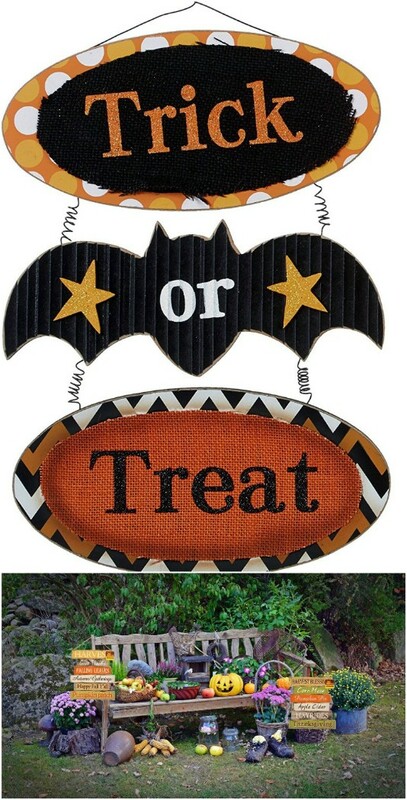 You can use any number of wooden pieces to create this Halloween directional wooden post sign. You could use an upcycled pallet or if you have wooden flooring or any other piece that has planks in, it that would work as well. You can also buy scrap wood pieces from home improvement stores and they’re really cheap. Just paint them white and then label each pointer with something scary! I love the bright Halloween colors in this door sign! 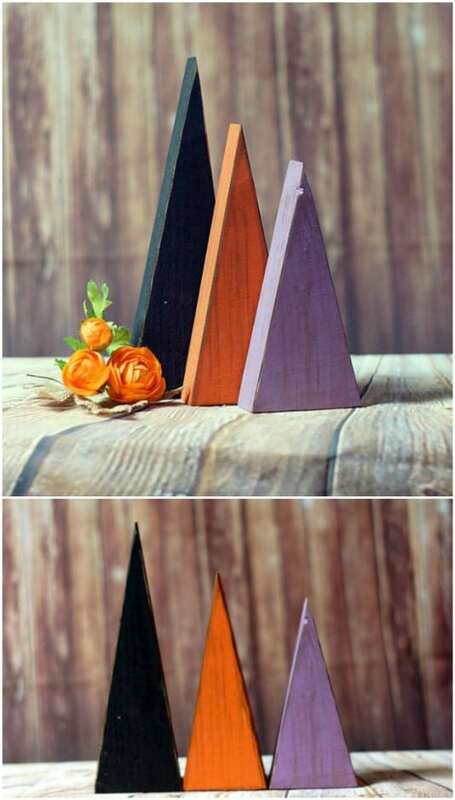 It’s made from reclaimed wood and painted in purple, green and orange for the perfect Halloween color. 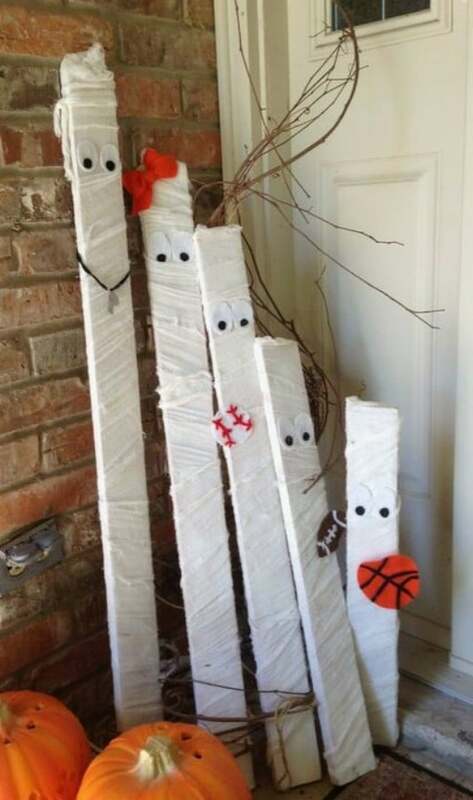 Once you have your wooden slats painted, just add your special message to guests or trick-or-treaters and then attach the wooden slats together with twine or rope for hanging, or you could use wire for hanging as well. 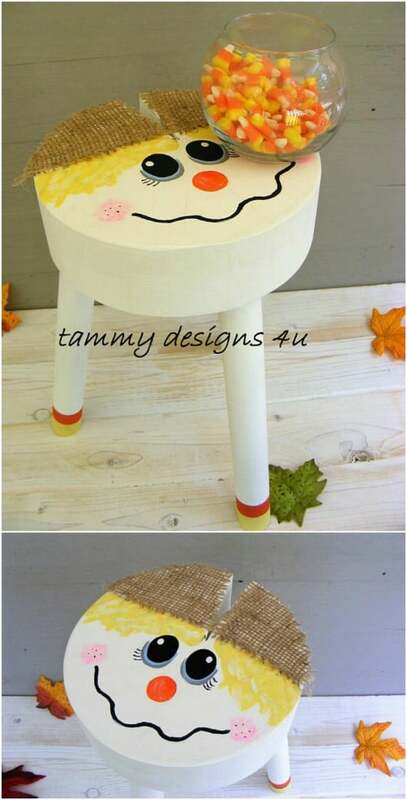 You can really decorate for Halloween with this adorable little scarecrow stool. Imagine this on the front porch holding your trick-or-treat candy! He’s made from reclaimed wood and painted the perfect colors for Halloween. You could even leave him out until Thanksgiving! This one is on Etsy for less than $40 and comes in a variety of different heights. 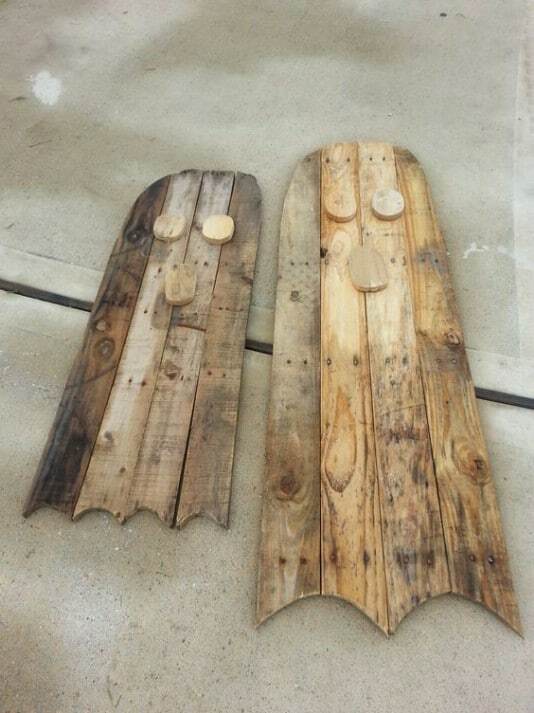 These adorable pumpkins are made from upcycled fence boards and they’re perfect for your outdoor Halloween decorating. If you don’t want a general Happy Fall pumpkin, you could totally paint these as jack-o-lanterns and really decorate that yard. They’re really easy to make and have such a great rustic look. 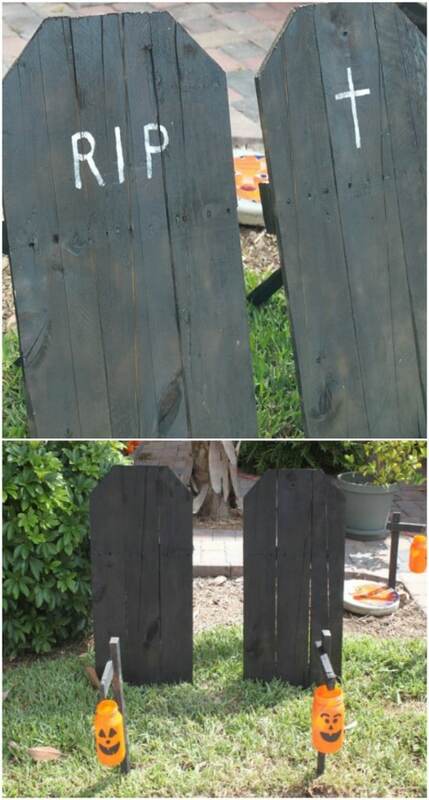 Use boards from an old wooden fence or you could tear apart a pallet and use those boards as well. 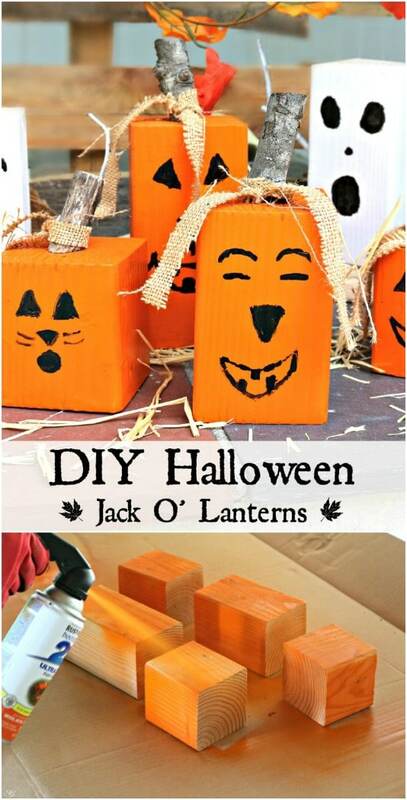 These wooden jack-o-lanterns are so easy to make and you can make them from reclaimed wooden blocks. Those blocks can be anything from bed posts to furniture legs. 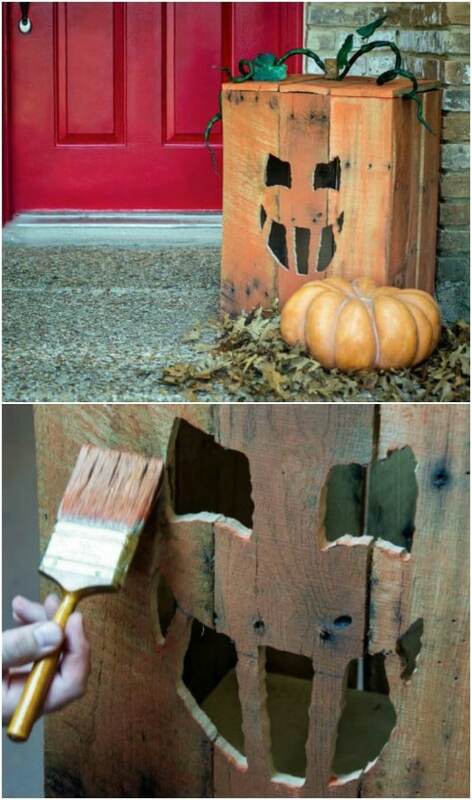 Once you’ve collected your wooden blocks, just paint them to give them a great jack-o-lantern look. You could also do block ghosts, witches, Frankenstein or just about any other scary creature you can imagine. 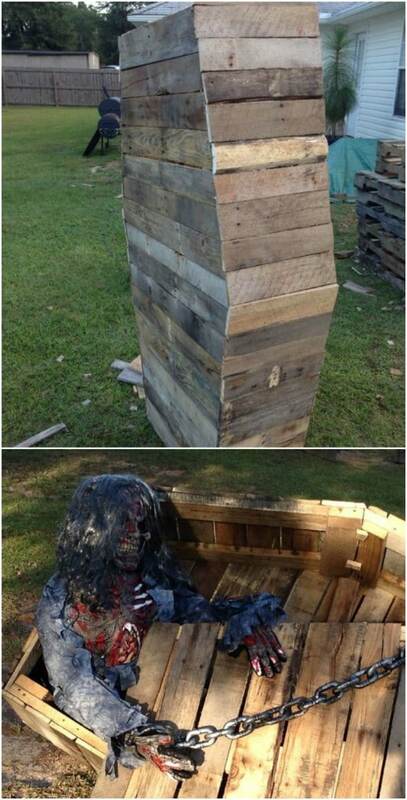 This coffin is made from old pallets and it has a certified zombie crawling out of it! If you’re a fan of The Walking Dead, you’re sure to love this Halloween décor idea. It’s great for inside a haunted house or outdoors in the yard to scare your guests and trick-or-treaters. It’s also a lot easier to build than it looks and will certainly get you some credit for your DIY Halloween decorations. You can build this spooky graveyard fence around your lawn quite easily and if you have a few old pallets or fence planks available, it won’t cost you anything but a little time. You don’t even have to do a great job – that’s the beauty of it! It’s supposed to look like it’s falling down so just nail those planks together and maybe lean them up against a tree. I love this Halloween fence. Not only is it easy, it’s really spooky! You just can’t go into Halloween without a bit of candy corn, right? Oh, and you should definitely try mixing it with peanuts. Trust me, you’ll love it. 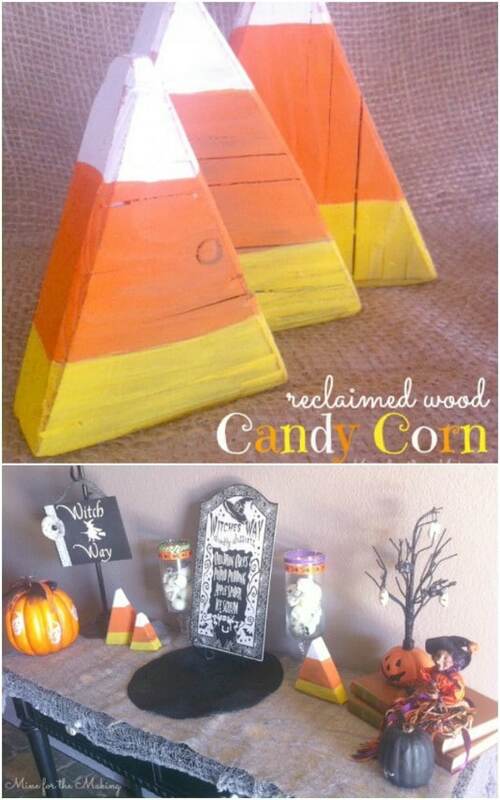 Now, you also need candy corn decorations, which is why these reclaimed wood candy corn decorations are perfect. You can make these out of any wood blocks that you may have on hand. You just have to cut them to the right shape and then paint! 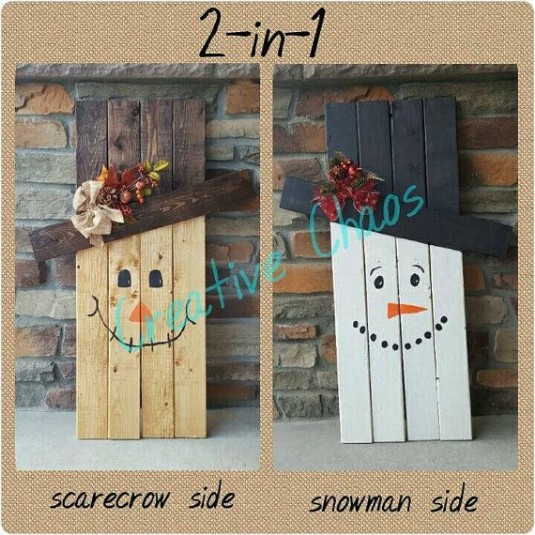 Not only can this Halloween decoration be made from upcycled pallets or other reclaimed wood, it’s also reversible so you get decorations for two different seasons in one. On one side, it’s a spooky Halloween scarecrow and on the other, you make it into a snowman! So, once it’s time to change out your decorations, this one can stay put. Just flip him over and he’s ready for Christmas. These little spooks are made from old wooden spoons and they’re absolutely adorable. I love how easy they are to make and they create the perfect stakes for your outdoor plants. 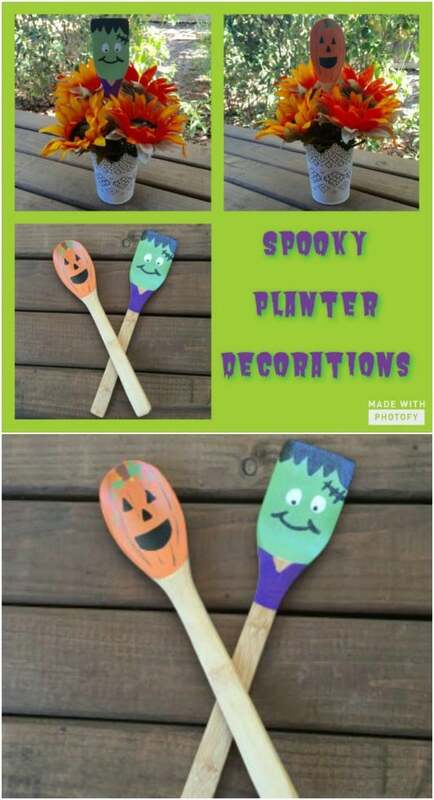 You just take those worn out spoons – or buy a package of three or four from the Dollar Tree – and paint them to make them spooky. Then just stick them into your plants or create a nice little decoration in your kitchen by putting them in a utensil holder. 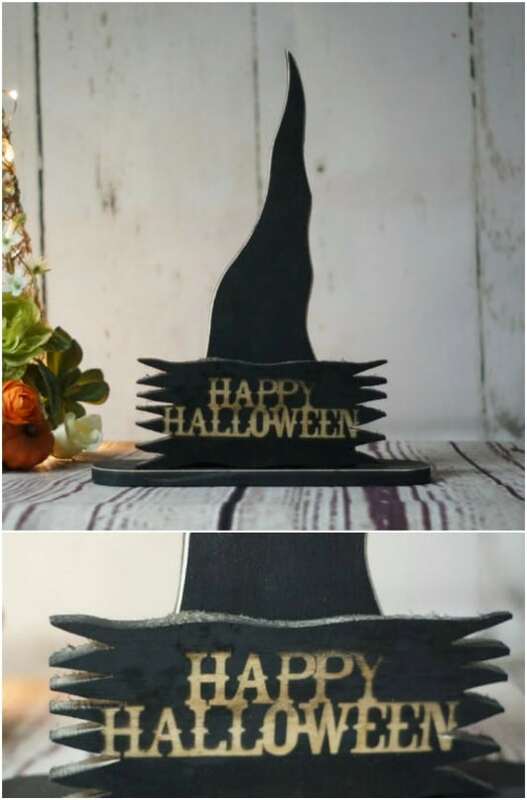 I love this little wooden witch’s hat that can be made from reclaimed wood. You could use a pallet or any plank type wood to make this. Or, you could just check out the one that I found on Etsy. It’s also made with reclaimed wood and has “Happy Halloween” painted right on it. The edges are distressed to give it a great rustic look. You can make this yourself, or pick up this one for $25. This pumpkin stand planter is perfect for Halloween decorating and you can keep it up through Thanksgiving! It’s made from upcycled pallets or plank fence pieces and it’s really easy to DIY. You just cut your planks to make the pumpkin shape and then connect them together, adding a box for holding all sorts of decorations, flowers or even your trick-or-treat candy. This box shaped jack-o-lantern is great for decorating the front porch or stairs and you can make it from upcycled pallets or fence posts. I love the large box shape. You could make the lid detachable and use this for storage. It would be great for storing those Halloween decorations between seasons and it’s super easy to make. You can make these adorable little mummies out of pallets, picket fence posts or just about any other wood that you want to cut down to size. Picket fence slats work perfectly and give them a wonderful shape. Once you have your pieces, you just wrap them in cheesecloth and add any decorations that you want, as well as felt or googly eyes to finish them off. You could totally customize these to your own family members by just adding decorations that match your unique personalities. This DIY pumpkin hanging is made from reclaimed wood and has a lovely 3-D effect. You can use pallets, fence boards or just about any other type of wood to create it. The 3-D effect is made by cutting a pumpkin shape in a board and then assembling a pumpkin from pallets or planks to put underneath it. It’s perfect for decorating your home or front porch for the holiday. These trees are so gorgeous and so easy to make from reclaimed wood. You just cut your shapes and then paint them in Halloween colors. Or, you could just grab these that I found on Etsy. You get a set of three for $17 and they come in different sizes, each painted a different color of orange, purple, or black. You can use these to decorate a table, mantel or the front porch. Here’s another great way to get some lovely Halloween pumpkins without spending any money – aside from paint, that is. 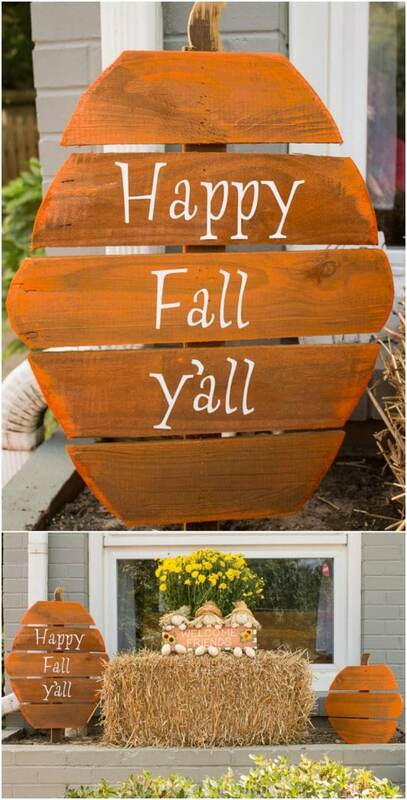 You can use old stumps or blocks of stumps to create adorable little decorated pumpkins to line your steps or porch. Just cut the stumps to size and then paint them into little Halloween treasures. Spray paint works well for the base color and then you can use acrylics, along with raffia and twine for the decorations. This great Halloween wreath can be made from an old cabinet door! If you’ve recently redone your kitchen cabinets, keep those doors for these adorable Halloween decorations. If you have to purchase a door, you can get one for just a few dollars at any thrift store. 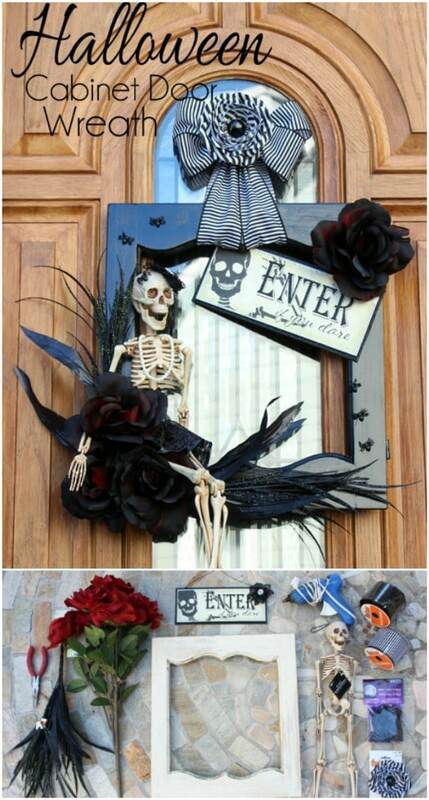 You just cut out the center of the door, paint it black and then add any decorations you want. The Dollar Tree has loads of things for decorating for just a dollar each. 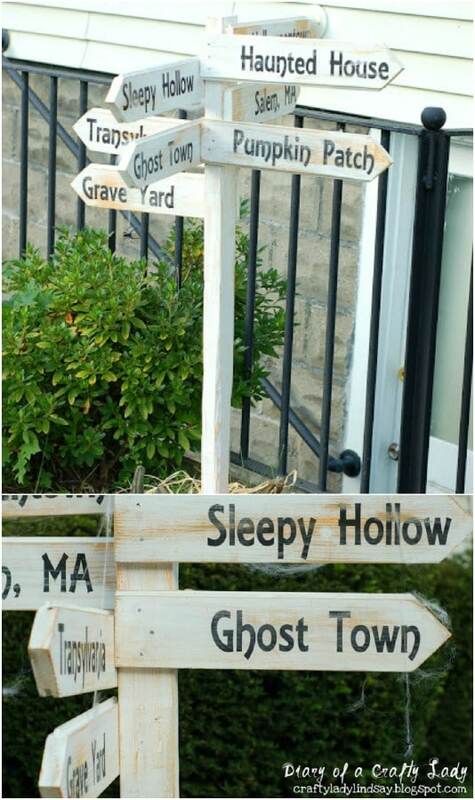 If you really want to decorate your yard for Halloween, these tombstones are a must. And, you can make them from reclaimed wood. These are so easy to make and so gruesome at the same time. You can use pallets, wooden fence boards or any other plank type boards that you may have on hand to create them. The older the wood, the spookier your little graveyard will be! This spooky entrance at the base of your yard will really frighten your trick-or-treaters and it’s an easy DIY with just a few wood pallets. If you have to purchase pallets, go for the oldest, dingiest looking ones. That will make it super scary. You build a would-be shack from your pallets and use it as the entrance to a haunted house or at the base of your porch so trick-or-treaters have to cross under it. 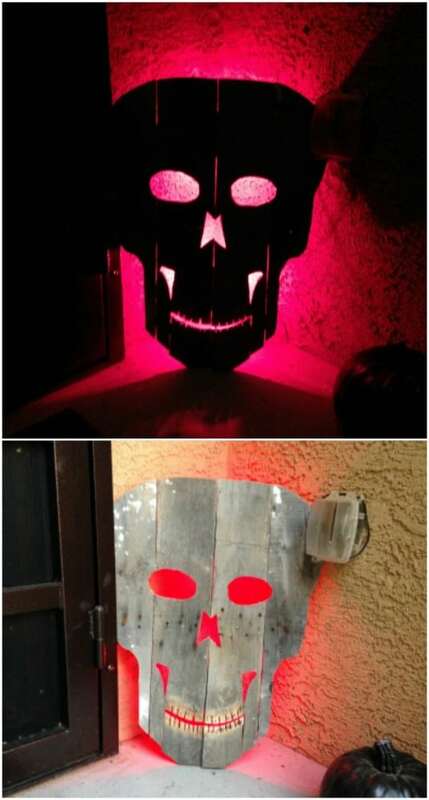 This spooky skull can be made from old pallets and it’s perfect for setting that scary mood on your front porch. 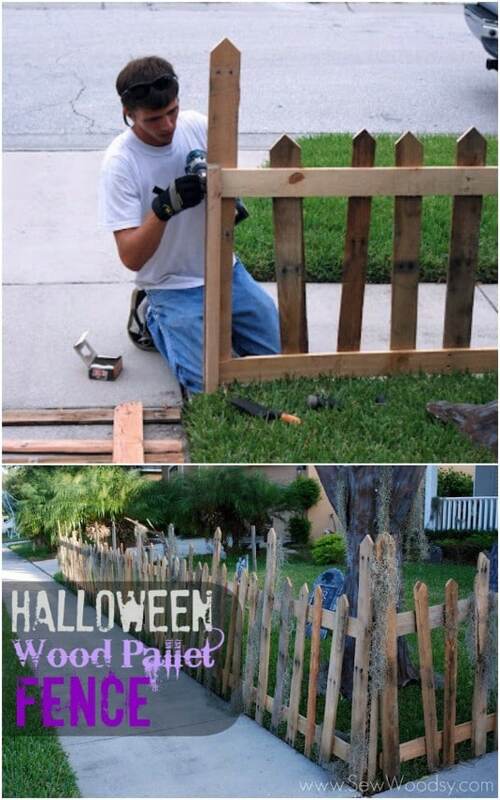 You can make a template for the skull and then cut it out of pallets or attached picket fence boards. Cut out the “face” and then stand it up on the porch. You can illuminate the skull and give it a freaky look by simply placing red lights behind it.